This is the time of year that we see mushrooms popping up all over the neighborhood - when we have a wet spring or fall it is especially bad. 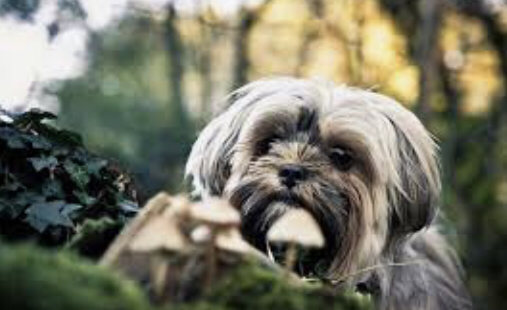 It is important to check your yard and remove any mushrooms you find - especially where your pup has easy and unsupervised access. All wild mushrooms should be considered toxic until proven otherwise. If your dog eats a mushroom, get to a vet or emergency animal clinic right away. Poisoning can happen with even a small bite. Signs of mushroom poisoning in dogs include wobbling, loss of balance, vomiting, seizures, salivating, yellowing of whites of eyes, and sleep like coma. Mushrooms are hard to identify. Many species both poisonous and non-poisonous look very much alike. It would be a good idea to bring in a sample wrapped in a moist paper towel or wax paper rather than a paper bag for a specialist to identify.